The handle on these ice picks have a larger diameter near the top, at lease one "waist", and a diameter greater than at the "waist" at or near the ferrule. As will be noticed from the photos, some handles have large changes in diameters while others are very subtle. L = 9", Pick designed to be able to change picks. There is a screw on the top of the pick to allow the removal and replacement of picks. No special markings. The shaft has an oval cross section of 0.30" by 0.20". No special markings. Comparison of size and shape of the two ice picks. L = 12-5/8", Cast cap lifter on end of handle. No special markings. L = 12-1/2", Flat metal cap lifter on end of handle, ferrule on each end of handle. No special markings. L = 10", Flat metal cap lifter on end of handle, ferrule on each end of handle. No special markings. This group of ice picks has a coiled spring in the handle. L = 10-1/2" extended, 9" compressed. TAPIT CHIPLESS, US & FOR. PATS. PEND. MADE IN USA on the paper label around the handle. The collection also consists of a green, yellow and red ice pick. Different original paint colors collected. L - 10-1/4" Extended, 8-1/2" Compressed. No markings. This shows different manufacturing techniques for installing and retaining the spring mechanism. Looking at the picture on the left - the pick on the left (darker red) has a hole in the end of the handle where the spring was installed and then plugged. Now, looking at the right picture, one can see a metal sleeve has been inserted in the other end of the handle of the lighter colored pick to house and retain the spring. NOTES: 1) The small hole in the center of the end of the handle of the lighter red pick has thread marks and probably was from an eye hook for hanging. 2) All the other picks of this style have the spring installed through the end of the handle like the dark red pick discuss here. TAPIT CHIPLESS, US & FOR. PATS. PEND. MADE IN USA on the paper label around the handle. L = 10" extended, 8-3/4" compressed. No special markings. Spring in handle allowing a 1-7/8" stroke. ANDROCK stamped on the ferrule. Spring in handle allowing a 1-1/2" stroke. ANDROCK stamped on the ferrule. L - 11-1/8", extended, 8-3/4" compressed. No special markings, just another color sample. L = 9-5/8" extended, 8" compressed. No special markings. L = 9" extended, 8" compressed. A 1" stroke, Spring in handle. No special markings. L = 10-7/8", CHATILLON stamped on the pick. L = 9-1/4", Pick configured to be replaceable. No special markings. This ice pick is considerably longer than the typical ice pick. It has a replaceable pick, held in place with a bolt and lock washer. 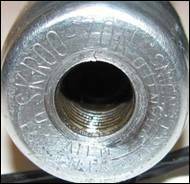 On the face of the ferrule where it interfaces with the pick bolt are these markings: SKROO ZON US PATENT ????????? and FOREIGN PATENT PENDING. Skroo Zon has a big line of file handles, but, I was not able to find any examples of ice picks. L = 7", No special markings. L - 9-1/4" No special markings. L = 9", No special markings. The patent is for a fastening mechanism for awls and similar tools so the blade can be changed if damaged. The shaft is marked "SURE HOLT". The patent calls for a transverse pin through the handle and tail of the mechanism in order to resist all twisting. Since this pick does not have the transverse hole/pin, it was made for an application that does not require twisting. Awls are twisted, so it's assumed this is an ice pick. G.L.Holt Co., Hartford, manufactured the pick. pick is replaceable with this configuration. By removing the transverse pin shown in the side of the handle, the split assembly can be removed and the pick/blade replaced and the assembly reinstalled. Another example of the "Holt" patent which enable the replacement of a broken pick. The pin exposed on the side of the handle is removed to allow the release of the mechanical assembly retaining the pick so it can be replaced. More information is provided in the "Holt" patent. L = 8-7/8", 0.25" pick, Oak handle. No special markings. L = 8-3/4", Long ferrule. No special markings. L = 7-3/8", No special markings. L = 6-3/8" MADE IN USA around the ferrule. No other special markings. L - 7-7/8", No markings. L = 9-1/8", Long ferrule. No special markings. L = 9-7/8", Long ferrule. No special markings. Hand carved and painted by a local artist. L = 9-1/4", No special markings. L = 8-3/4, No ferrule. No special markings. L = 9-1/8, No special markings. YORK ICE & MILK CO. stamped on the end of the handle. No ferrule. L = 8-3/8", No special markings. L = 8-1/2", No special markings. L = 10-1/2", 0.24" pick. No special markings. L - 7-1/2�, Thick pick - 0.25" diameter. No markings. L = 9-1/4", Long ferrule, No special markings. L = 7", Long ferrule. No special markings. L = 10", Eight flats on handle. No special markings. Brass ferrule. No marking. This tool is probably an awl, but I expect it was used as an ice pick at some time. L = 10-1/8", No special markings. L = 9", No ferrule. No special markings. L = 9-1/4", Ferrule missing. No special markings. L = 8-7/8", No special markings. L - 8 -3/4", No markings, Same shape of the handle used for patent 1,693,269 as shown in the box to the right. Looking at the paint remaining on the handle, I think the ice pick may have been sold with and without the metal cap. Another sample of the same shape of pick handle shown in patent 1,693,269, Nov 27, 1926 without a metal cap. No markings. 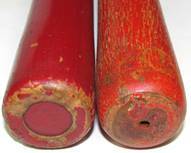 L = 7-3/8", MADE IN USA marked on the ferrule. L = 8-1/8", No ferrule. No special markings. L = 8-5/8", No special markings. L = 6-3/4", No special markings. L = 8-1/8", No special markings. L = 7-1/4", No special markings. L = 5-1/4", No special markings. L - 7-1/2", No markings. L - 7", MADE IN USA around the ferrule. L - 9-7/8", Design did not include a ferrule. No markings. The pick cover is tapered.